A giant panto extravaganza is in town, telling the tale of Jack and his journey to Cloudland. Times Square Pantodrome is transformed into a winter wonderland of festive fun for the whole family. 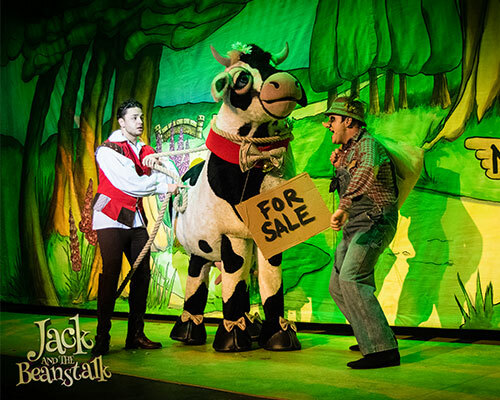 The pantomime season is now in full swing and making it’s debut from Newcastle’s Times Square Pantodrome is Jack and the Beanstalk – with a Geordie twist. Produced by local company, Nice Swan, you can tell that a lot of love and thought has gone into this panto production and the result is a side-splitting show loved by kids, big kids and adults alike. The story follows Jack (played by Emmerdale and I’m A Celebrity’s Adam Thomas), his brother simple Si (played by Sam Glen) and their mother Dame Trot (played by Daniel Mawston). Jack falls head over heels in love with Princess Jill (Helen Slade) and wants to marry her but first he must defeat the evil Fleshcreep (Stephen Sullivan) who works for the nasty Giant in Cloudland, all with the help of Mother Nature. The cast work so well together in this panto and it’s clear that they’re all just having a whale of a time from start to finish. Adam Thomas is the star of the show and the most familiar face on stage – he’s the brunt of most of the jokes with many I’m A Celebrity and Emmerdale references thrown into the script, all of which he takes in great humour as intended. A mention must also go to Helen Slade who plays Princess Jill. Her voice is so sweet and innocent and she perfectly fits the role of an enchanting princess. Little ones are in awe of her and the adults appreciate the raw talent. The show is full of funny innuendos that have the grown ups belly-laughing throughout, as well as plenty of silly puns which kept the children amused. You’ll be wowed by the musical numbers, impressed by the fantastic dance routines and you’ll be raring to get involved in all the audience interaction – reminding us why we love panto season! You really do get the feeling that this show has been written and produced locally – with references to Northumberland Street, Benwell and Byker, as well as jokes about the rivalry between Newcastle and Sunderland. The Pantodrome itself is a lovely space and we’re surprised by the size and how warm it is inside. We love this new concept – a contemporary theatre injecting a fresh new vibe to panto season in Newcastle. It’s also worth pointing out that the toilets are far from ‘festival style’ – you’re not in a tent here, it’s a purpose built theatre and we love the layout. Who doesn’t love a bit of panto magic over the festive period? Round up your kids, aunties, uncles, grannies and neighbours – they’re all going to love this one and it’s a great opportunity to try something new at the Times Square Pantodrome. It’s on now, until Saturday 30th December.